beautiful thorns: Even the Rocks Will Cry Out! Luke 19:40 - Jesus answered, "I tell you, if these were silent, the very stones would cry out." One doesn't need to just look in religious circles to know what the Lord is currently saying and doing. Often the Lord speaks through current events and even from movies. We just need to ask the Lord to give us eyes to see and ears to hear. A couple of kid movies that are currently out that I see the Lord speaking through is the movie by DreamWorks, "The Croods" and Disney's "Frozen". Both are powerful movies that focus on self-sacrificing love, the power of the family, and stepping out and taking risks. In "The Croods", the Crood family, out of fear stays secluded from the outside world and day after day, they stick with only what they know. One day, their world is shaken and they are forced to go outside their comfort zone and take a huge leap of faith. What they encounter is both frightening and beautiful. In one scene, Guy and Eep are attacked by flying piranha like creatures. Guy then lights a torch and holds onto Eep. 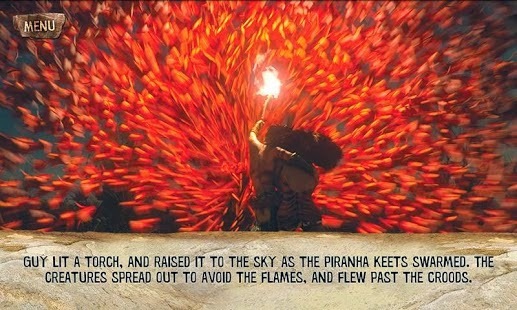 As they cling to each other under the light of the torch, all the flying piranha fly past them and they are protected. In the same way, when we put Christ who is our light, first in our life and relationships, we are protected from the evil forces around us. Like the David Crowder song, "I Am", we need to hold on to Christ even in the middle of the storm. Another scene in "The Croods" that was powerful and reflected the self-sacrificing love of Christ was toward the end when the Father decides to put himself in harms way in order to save the rest of his family. The only way they can get to safety and cross over the wide gap is if the father throws them to the other side, which inevitably means disaster for the father. In the movie, "Frozen", both Anna and Elsa who are sisters take turns sacrificing their lives for one another. In the end, it is only an act of true love that can save Anna. Anna is willing to sacrifice her idea of what she thinks this act of true love is for her sister, Elsa which actually ends up saving her and thawing out her "icy heart". I believe one reason we are here on this earth is to be perfected in love. One way the Lord does this work in us is through difficult people and difficult situations. We can try to avoid people and situations and avoid sin but that doesn't mean we are virtuous. We are only as virtuous as we are in the worst of situations. In other words, even if we avoid external sin, sinfulness still resides in our hearts. Sometimes we don't need to go far because the most difficult people can be found within our own family. If we will yield to the Lord even in these difficult situations and relationships, clinging to him, the Lord will perfect us more and more in his love. The word right now for the Body of Christ is "Love one another!". Not a warm fuzzy, filial love but Christ-like agape, sacrificial love. This is the kind of love that can dispel the darkness, get us through the storms of life and melt icy hearts!